A regular breeding resident and migrant, the American Coot is regularly observed during the winter months, with reports most frequently documented in central and southeastern Minnesota. The American Coot was an uncommon species during the Minnesota Breeding Bird Atlas (MNBBA). The core of the American Coot’s breeding range in North America is in the northern Great Plains of the United States and the Prairie Parklands of the central Canadian provinces (Figure 1). Although far less common elsewhere, the species is a year-round resident across much of the western United States and further south through Central America and the Caribbean. Ranked as Low Concern by the North American Waterbird Conservation Plan and assigned a Continental Concern Score of 8/20 by Partners in Flight. Northern populations are medium- to long-distance migrants; most coots winter along the southern Atlantic Coast, the United States Gulf Coast, the lower Mississippi River valley, and in Central America. Pecks food from the water’s surface or just below and occasionally dives, feeding on a wide variety of aquatic plants, invertebrates, and small fish. Known as a kleptoparasite, the coot frequently secures food items by stealing from other waterfowl nesting in its wetland marsh. A platform anchored to stems of emergent vegetation, occasionally with a ramp leading to the water’s surface. Numerous platforms are constructed during courtship; one is usually selected for the eggs. A larger platform for the brood may be constructed after the eggs have hatched. Breeding distribution and relative abundance of the American Coot in North America based on the federal Breeding Bird Survey, 2011–2015 (Sauer et al. 2017). Since Roberts wrote his two-volume treatise on Minnesota birds in 1932, the American Coot has always been recognized as an abundant breeding resident wherever suitable wetland habitat was available. He wrote, “During the month of June hundreds of Coots’ nests may be found in practically all the sloughs and shallow lakes of the state.” Despite the species’ abundance, confirmed nesting reports were only available from the handful of sites that Roberts, his colleagues Walter Breckenridge and William Kilgore, or his outstate contacts frequently visited: Heron Lake in Jackson County, numerous sites in Minneapolis and throughout Hennepin County, and in the far northwest counties of Marshall and Kittson. Green and Janssen (1975) and Janssen (1987) further clarified that although the species was a statewide breeding resident, it was rare in the northeast and far north-central counties. Janssen described its primary range as occurring “west of the Mississippi River in the northern and central regions and west of Goodhue, Dodge and Mower counties in the south.” Data collected by the Minnesota Biological Survey further confirmed this assessment (Minnesota Department of Natural Resources 2016). Janssen (1987) delineated 46 counties where nesting had been confirmed since 1970; Hertzel and Janssen (1998) later added an additional 13 counties to the list. During the MNBBA, observers reported 490 American Coot records in 7.3% (349/4,749) of the surveyed atlas blocks and in 7.7% (180/2,337) of the priority blocks. Breeding evidence was collected in 85 blocks (Figures 2 and 3; Table 1). In total, the coot was reported in 72 of Minnesota’s 87 counties and was confirmed breeding in 35 counties. Several of these counties were additions to the list published by Hertzel and Janssen (1998)—Dakota, Freeborn, Renville, Sibley, and Traverse—as well as a breeding record from 1 block that straddled both Red Lake and Pennington. Only 13 of the MNBBA observations, including 1 breeding record, were within the Laurentian Mixed Forest Province of northeastern and north-central Minnesota. A majority of records were within the southern half of the Prairie Parklands. Although the American Coot’s current distribution appears similar to that described by Green and Janssen (1975) and Janssen (1987), the species’ abundance has clearly declined since the days of Roberts, when hundreds of birds could be found in any given wetland. Elsewhere, declines in both abundance and distribution have been noted since the early 1900s. While the American Coot’s distribution has expanded westward, it has retracted and become quite scarce in the east, no doubt due largely to the extensive loss of wetlands (Brisbin and Mowbray 2002). In the late 1960s, coots began to decline along the western Lake Erie marshes in Ohio, where they had been a common nesting species. Inland, populations began to decline in the 1950s and 1960s (Rodewald et al. 2016). Many coastal wetlands along the Great Lakes that provided prime breeding habitat for the American Coot in Michigan were lost in the 1980s. Between the state’s first and second atlas, block occurrences in Michigan declined 43% (Chartier et al. 2013); in Pennsylvania, they declined 28% (Wilson et al. 2012). Breeding distribution of the American Coot in Minnesota based on the Breeding Bird Atlas (2009 – 2013). Summary statistics of observations by breeding status category for the American Coot in Minnesota based on all blocks (each 5 km x 5 km) surveyed during the Breeding Bird Atlas (2009-2013). Summary statistics for the American Coot observations by breeding status category for all blocks and priority blocks (each 5 km x 5 km) surveyed during the Minnesota Breeding Bird Atlas (2009-2013). The American Coot breeds in a wide variety of wetlands, ranging from prairie marshes and lakes to sewage ponds and canals (Figure 4). Two primary characteristics define suitable sites: dense stands of emergent vegetation and standing water (<1.2 m) (Gullion 1954). As a result, the species is more closely associated with semi-permanent and permanent wetlands than with seasonal or temporary wetlands. The latter are more frequently used during years with high water. Although brackish wetlands may occasionally be used, freshwater sites are preferred (Tacha and Braun 1994; Brisbin and Mowbray 2002). Typical breeding habitat of the American Coot in Minnesota (©Lee A. Pfannmuller). Despite its relative abundance and wide distribution, information on the American Coot’s population size is imprecise at best. Data have been gathered through two main venues: the annual Waterfowl Breeding Population and Habitat Survey, and the annual federal Breeding Bird Survey (BBS). Although both surveys present challenges relative to the data collected for the coot, they corroborate each other with a general estimate of 3 million birds residing in southern Canada and the United States (Brisbin and Mowbray 2002). Waterbird biologists estimate that the global population of the American Coot numbers close to 6 million birds (Wetlands International 2016). An estimate of the number of the American Coot in Minnesota is not available. As noted earlier, the core of the species’ breeding range lies west of the state, in the Prairie Pothole Region of central North Dakota and the Prairie provinces of Manitoba, Saskatchewan, and southern Alberta (Figure 1). Indeed, the average number of coots observed per BBS route each year is 38 in Saskatchewan and 27 in North Dakota; in Minnesota, observers report an average of only 1 coot per year per BBS route (Sauer et al. 2017). Historically, the American Coot was one of the most abundant members of the Prairie Pothole avifauna. Yet as the prairie sod was converted to a productive agricultural landscape, the species’ population plummeted due to wetland drainage and intense harvesting pressure. The American Coot’s population declined slowly for several decades after the BBS began in the mid-1960s; more recently, it has increased amid wide fluctuations that are likely a response to wetland and drought conditions in the Great Plains. (Brisbin and Mowbray 2002). Overall, the population has remained relatively stable since the survey began, with a nonstatistically significant change of 0.62% per year. However, the population change has increased substantially to 10.03% in the most recent 10-year reporting period (2005–2015) (Sauer et al. 2017). In Minnesota, the situation is quite different. Since 1996, the BBS has documented a rather dramatic and steady decline in the Minnesota population of the American Coot. Data show a significant average annual decline of 5.28% from 1967 to 2015, representing a cumulative decline of nearly 93%. Although at the national level the population has shown a remarkable increase since 2005, in Minnesota the rate of decrease has simply stabilized (Figure 5). Compared to the national trend, the rather dramatic statewide decline is an enigma. Data, however reveal that populations throughout the Great Lakes region are experiencing significant declines, as evidenced by BBS data in the Boreal Hardwood Transition Region, where the species has demonstrated a non-significant decline of 5.04% per year, and by data gathered by the Great Lakes Marsh Monitoring Program. Begun in 1995, this binational program surveys marsh birds and frogs at more than 5,000 locations in the Great Lakes Basin. From 1995 to 2012, the American Coot declined an average of 10.1% per year (Figure 6). But just west of Minnesota, the Prairie Pothole Region is experiencing the only significant population increase in North America, rising at the rate of 2.24% per year since 1966, with an even more dramatic increase of 14.24% since 2005 (Sauer et al. 2017). Regional data on the American Coot also are collected by the annual Waterfowl Survey conducted by the Minnesota Department of Natural Resources. The data show extremely wide fluctuations in numbers from year to year (Cordts 2015). When the survey is conducted in May, many coots are still migrating north, so these data may be a less reliable long-term statistic than the BBS, which is conducted in June. Nationally, the species’ population is considered stable in part because, unlike most waterfowl species, the American Coot is more dependent on semi-permanent wetlands, whereas ducks rely more heavily on temporary and seasonal wetlands. As a result, it is better able to weather drought conditions. But in Minnesota, the significant downward population trend of the American Coot is not unlike that observed for many waterfowl species in the state and likely reflects the impacts of large-scale wetland loss and degradation. Breeding population trend for the American Coot in Minnesota for 1967–2015 based on the federal Breeding Bird Survey (Sauer et al. 2017). American Coot abundance in the Great Lakes Marsh Monitoring Program 1995–2012 (Tozer 2013). Despite its declining population in Minnesota, the American Coot is not a conservation priority at either the state or federal level. The North American Waterbird Conservation Plan (2006) has ranked the species of Low Concern, and it has been assigned a Continental Concern Score of only 8/20 (Partners in Flight 2017). 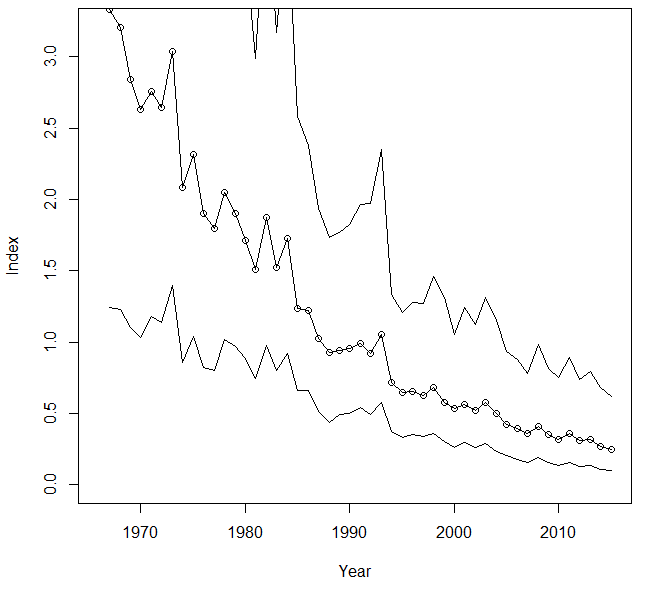 If the steep decline in Minnesota’s breeding population shown in Figure 5 continues, the lack of conservation attention on this species at the state level should be reconsidered. The American Coot is a harvested species throughout its range. In Minnesota, the daily bag limit is 15 birds and the total possession limit is 45 birds (Minnesota Department of Natural Resources 2015). Nevertheless, the level of hunting pressure placed on these birds is relatively low. Minnesota is considered one of the few states where the species is not underharvested. During the past 10 hunting seasons, from 2006–2007 to 2015–2016, the estimated number of Minnesotans hunting the American Coot averaged approximately 4,000 and the average annual harvest was a little over 18,000 birds (Dexter 2016). This compares with an average annual state duck harvest of 690,000 birds during the same period. In 2015, the total harvest of coots in the United States was approximately 253,200 (Raftovich et al. 2016). Long-term, the number of coots harvested in both Canada and the United States is declining (Brisbin and Mowbray 2002). Although the American Coot has been initially rated as having a low vulnerability to warming temperatures, the core of its population occurs in the Prairie Potholes, a region projected to experience more drought conditions and more severe storm events (North American Bird Conservation Initiative 2010). Conservation measures designed to benefit Minnesota’s diverse waterfowl community should also provide benefits to the declining population of American Coots. In particular, aggressive efforts to protect and restore grasslands and wetlands through the Minnesota Prairie Conservation Initiative should have lasting, positive impacts on regional populations of the American Coot (Minnesota Prairie Plan Working Group 2011). Gullion, Gordon W. 1954. “The Reproductive Cycle of American Coots in California.” Auk 71: 366–412.